I admit, I love kitchen gadgets and tools. I think most cooks do too. Especially with holiday baking coming (or maybe you’ve already started yours! ), that’s when kitchen goodies come in really handy! That’s why I’m super excited to be sharing a giveaway with you today for Dreamfarm. What’s Dreamfarm, you ask. Well, my friends, it’s a really cool Australian company that makes the world’s best kitchen tools and gadgets. These aren’t just your normal ordinary boring gadgets, these are things that solve a problem and work better than anything else on the planet. Check out all of their super useful creations at their website. Their kitchen goodies are so fun to look at and to use! Colorful, and fun to play with. Ingenious design solutions! And, these would make great Christmas gifts for your favorite cook. I won’t tell if you win and give these as gifts; they’re that cool! This prize package has a total prize value of $104.65. How cool is that! Please note: Dreamfarm will be shipping the winner these giveaway items directly. The winner will be randomly selected. You must be 18 years + or older. Just follow the widget instructions below. Please see the end of the post for disclosure statement. All items look great, but I really like the levup – self measuring cup! My fave kitchen tool is my microplane zester. Well today I could really use that pizza cutter as mine broke! The measuring spoons would also come in handy for my baking. My favorite kitchen tool is my pot top strainer. I love a good spatula!!!!! I like my OXO vegetable peeler. My favorite kitchen tool is my veggie chopper. My favorite kitchen tool is my collection of whisks. My favorite kitchen tool is my food processor! Love it and currently use it at least three times a week. My favorite kitchen tool is the flat metal spatula. Fond of my hand juicer. My favorite kitchen tool is my silicon whisk. I find myself reaching for it daily. My favorite is a grater. My favorite kitchen tool is my cookie scoop. My favorite kitchen tool is my zester. I love the taste of fresh zested fruit in recipes. I like an egg beater! Sounds silly but I love my new strainers of all different sizes!! My girls love to cook. Their favorite tool would be the peeler or the whisk. for me it would have to be my handy blender! 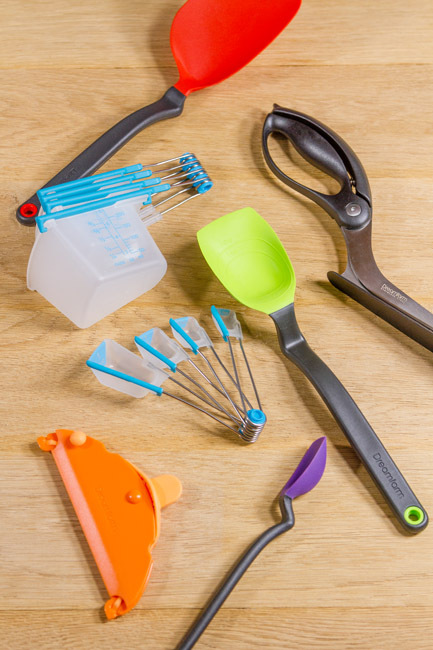 You can never have too many kitchen tools – especially good ones! My meat chopper tool for cooking hamburger! We have a garlic grater that I just love. I like using my microplane to grate ginger and garlic, or to zest limes and lemons. I would love to try the zester. I bake a lot and this would be so helpful. My favorite kitchen tool would definitely be my chopper. It comes in handy so much! I have a great garlic press that I use often. My favorite kitchen tool is my blender. My favorite gadget is a jar opener that breaks the seal on vacuum sealed jars. Measuring cups are my favorite kitchen tool! I use my chef’s knife all the time. My little hand held mixer is a dear companion. I have a mix and chop tool I love! I have the Dreamfarm Garject!! We love it! It’s so fun to use! kristiedonelson(at)gmail(dot)com Thank you! Merry Christmas! My favorite kitchen gadget might be my garlic press. I love it! My favorite kitchen tool is tongs. My favorite tool is the Ninja Chopper ! I have a great chef’s knife that’s my must have tool. I love the level on the measuring cups! Genius idea and definitely my favorite! My cookie scoop is my favorite! I have one if those spatulas. Love them!!! Nothing is better than my garlic press! I love my Ninja blender. My favorite kitchen tools are my knives. When I started out I was super broke but I splurged on my knife set because they are essential. Can’t do without tool is a spatula…….or a whisk…….or both. My favorite tool is my silicon cupcake cups! I love my silicone mats. My favorite kitchen tool is my garlic press–such a time saver! I love my garlic press–such a time saver! I like spiral whisks the most. I have a few favorites, my different sized cutting boards, a really good knife, different size spoons and spatulas. This giveaway sounds awesome I sure hope I win. My favorite kitchen tool is a sharp knife. I do really like my Veggie Chopper. My favorite kitchen tool is my apple slicer…(I just wish I could FIND it)! LOL! I love and couldn’t live with out my Stainless-Steel Silicone Tongs! I use them in every aspect of cooking! I couldn’t live without my garlic press because I put garlic in almost every dish! Sharp knives are the kitchen tool I couldn’t cook without! I love a good wooden spoon! I love all sorts of kitchen tools and gadgets. My favorite item is my 8 Cup Pyrex measuring cup. My favorite is the garlic press. I love these gadgets so much- they’re just so useful and practical! Right now I think my favorite kitchen item is a regular old vegetable peeler, it’s so terrific for slicing cheese I can not even tell you! A good spatula that will mix and scrap efficiently. My favorite kitchen tool is my paring knife. My favorite kitchen tool is my food chopper.